If you have a cat whose breath, pee, and poo all stink, you'll want to know about Good Bye Odor, an "internal waste deodorizer." "A what?" you may rightly ask. Well, this product aims to introduce new enzymes and amino acids to your cat's digestive system so his "effuse" is not offensive. As you might guess, I'm a bit skeptical about products that fool with a pet's internal chemistry just to appease us humans. But either my cat doesn't stink, or whatever he and I are doing to control foul odors is working; so I just can't identify with the stinky cat problem right now. 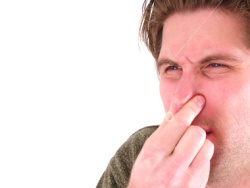 For those of you who want to give Good Bye Odor a try, it's a kind of in internal deodorizer your cat ingests through his food and water, if he's willing, that is. Good Bye Odor is in gel form and it should be squirted regularly into your cat's food and water bowls for about 7 days in order to smell the benefits. 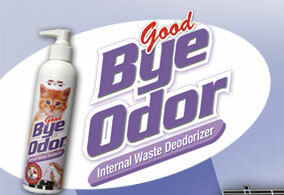 Good Bye Odor is a patented formula, and a "completely safe and natural product," according to its advertising. It contains: Deionized Water, Aspartic Acid, Threonine, Serine, Glutamic Acid, Glycine, Alanine, Valine, Methionine, Isoleucine, Leucine, Tyrosine, Phenylamine, Histidine, Lysine, Arginine, Cysteine, Proline, Xanthan Gum, Sodium Benzoate, and Potassium Sorbate. Want A Highly Portable Solar Lantern? Now will he eat his food with this stuff sprayed on? Otherwise neat idea & LONG OVERDUE. So it contains amino acids and some preservatives? Sounds worthless to me, I wouldn't waste your money on it.